I’ve recently begun digging around in materials about the history of various Rice songs. I don’t know whether this is surprising or not but that history is quite tangled. Songs–fight songs, alma maters, hymns– kind of came and went, some disappearing altogether, others changing tunes or lyrics at various points. 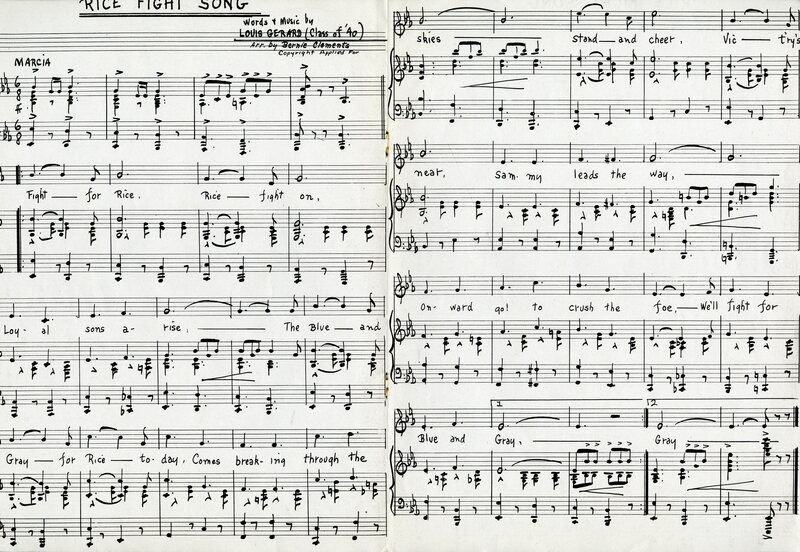 I was especially delighted with this one, a very popular fight song from the 1940s that I wasn’t familiar with. Charmingly, it was written by Louis Girard ’40, last seen in the pages engaged in a quixotic battle to make hockey popular in Houston. But . . . but . . . the lamp post! It’s got one of those ugly globe tops and this was taken at least six years before this one was installed in front of the gym, blowing my theory about their origins straight to hell. Bonus: I can’t remember where this is. 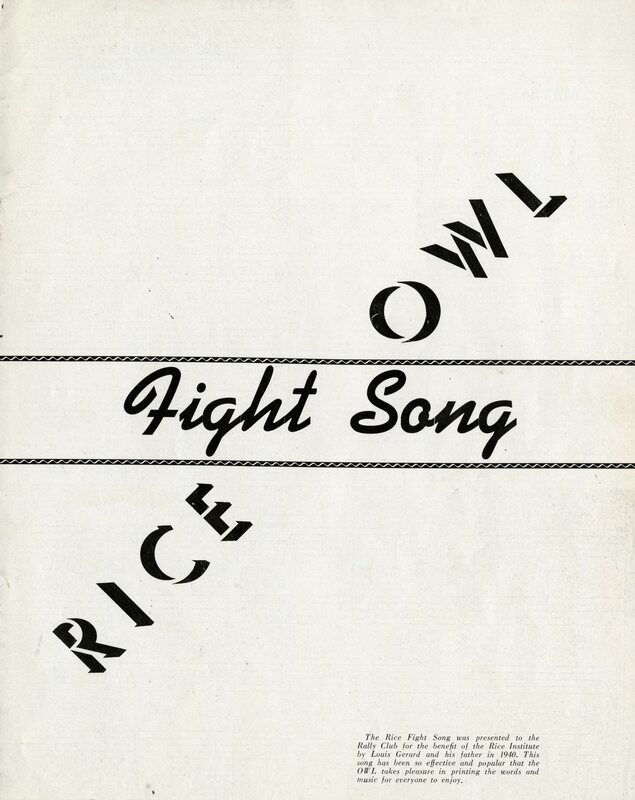 That “Fight for Rice” song is the Rice fight song I remember from the late 60s/early 70s. Is it no longer used? (We used the much shorter “(Put on Your Old Grey) Bonnet” when something quicker was needed. I remember singing this Fight Song from 1962 – 1965. The band also played it at a very fast tempo after every touchdown. That was before the Owl band became the MOB. Umm, they still sing that at every football game…I know we sang it in the 90s. I’m fairly sure I’ve never been to a Rice football game, although I have heard pieces of them on the radio. We could probably find a place for you IN The MOB, on and off the field, if you’d like. Melissa in the MOB! Gotta see that! 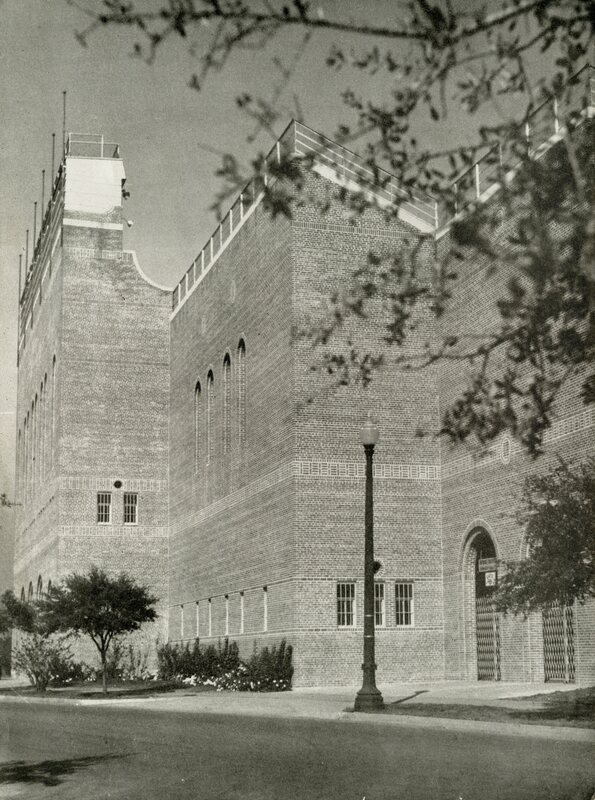 That is some seriously stylish brickwork on the old stadium. 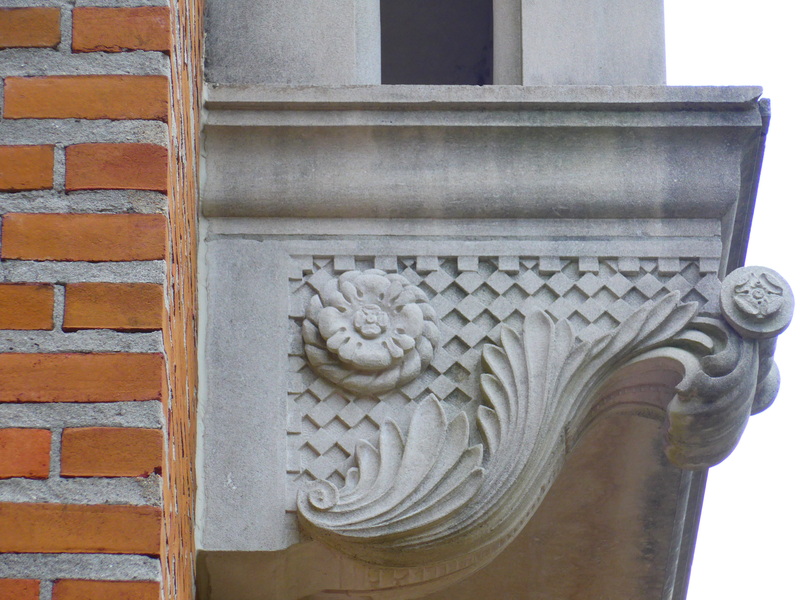 Note the end-on courses every four, the lovely courses above and below the windows, then the big pattern. They don’t lay brick like that any more. That would be Harvin C Moore (Drum Major ’28), and Barry Moore (Drum Major ’61) adapted “Bonnet”. They donated the annotated sheet music that they used for this, to The MOB. What an awesome facade. I wish it was still there. They demolished the wrong side of the stadium. Sid Rich splash those guys. come falling from the skies. we’ll wash Will Rice away. Go, Go, yee, yee, yee. I know that they came from Sid 2nd floor, 1974-75. As I recall, the author was Willie Moreno, but others may know better. I trust you have read my article on this subject in the Cornerstone: http://hdl.handle.net/1911/88464. I do recall that the history was quite tangled (I gave Woodson at least a few materials I found during my research, though I may have a few other items, including a recording of a song or two that Woodson may or may not have). I hadn’t seen that, David. I’m going to print out a copy of it and add it to the basic info file. The Rice Band of 1941 was under the direction of Kit Reid, I was a freshman. The Fight Song was the one listed here with the words as shown. The Band would play and he student body sing. The Fight Song was used in the stands and on the field at half time. ‘Put on Your Old Grey Bonnet’ with the blue ribbons on it and we’ll hitch ole Sammy to the sleigh we’ll rock rock ’em and sock sock ’em till the end of judgement day! was used at fast tempo at high points in a game. The same songs were used in the same way when I returned from WWII to complete my degree in 1948. .